I am a huge fan of reading.. Im not really sure when this happened because I remember when I much much younger, I used to tease my mom all the time about how much she read and couldn't understand it because I thought it "boring".. I guess things change with age.. Anywho... Are you doing any summer reading this year? Do you read all year round like I do?.. Do you use an E-Reader? No offense to those who use those gadgets, I just can't.. I tried and it was like a foriegn concept not only to my eyes but also my hands.. I love love love the feel of a real book in my hands, turning the pages, the smell of a new book.. 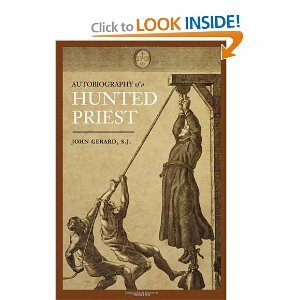 Right now I am currently reading a book called "Hunted Priest"..
My reading interested are mostly Catholic reading, about the Saints, biographies, Jesus, anything to do with the Catholic Church... What do you like to read? I am reading 2 books at once right now. One on my Kindle and the other is hardback. I love the Beverly Lewis series about life in the Amish community. All fiction, but good. I have always been a reader from the time I could read. My oldest grandchild is like that and my oldest son was too at that age and still to this day can read a book a day if he wants to. Most of my reading right now has to do with understanding the Catholic faith or living it out. I am reading The Jesuit Guide to Almost Everything by James Martin, SJ, Introduction to Mary by Mark Miravalle, Triumph: The Power and the Glory of the Catholic Church by Crocker, The Baltimore Catechism, The Imitation of Christ by Kempis and The Catholic Controversy by St. Francis De Sales I recently finished The Catholic Perspective on Paul by Taylor Marshall,and The Catholic Mary by Dave Armstrong. I tend to read a bit at a time in each book I am reading. I also do a lot of reading online on certain blogs to understand more about the Catholic Faith. (2,000 years is a lot to get through!) If you like reading true stories about priests , the one called Priestblock 25487: A Memoir of Dachau was good. When my mind needs a rest I sometimes read a good ole mystery. Hi Robyn, I just read your morning ritual with the dogs, boy I am exhausted just reading what you do. I think special need dogs end up with very special people. My Max has wheat and corn allergies, I bad hip and a muscle atrophy disease in his face. He has more fatty tumors than I can count, but I just love him to death. Hope you husband gets relief from the upcoming back surgery. By the way I love to read, too.